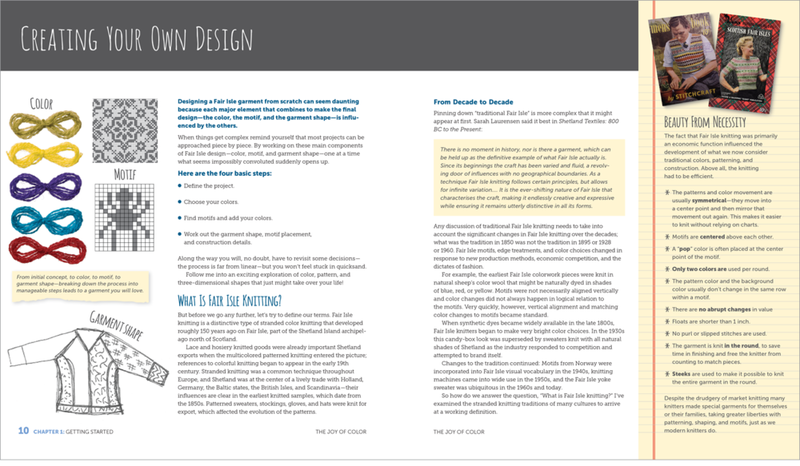 A 160-page workshop-in-a-book for Willa Jean Press, Berkeley, California. Published September 2016. BEFORE The client, a knitwear designer and fiber arts teacher, hired the studio to recreate her popular knitting workshop in book form. The design goal was to create a friendly, tactile experience for readers intimated by the color process for Fair Isle knitting. Each chapter was submitted to the studio as an InDesign file pre-designed by the client (see Before pages below). AFTER To guide the client into new levels of content sidebars, new levels of typography, and visual material cues like yarn snippets were developed. Placeholder text was written to show form. The sidebar on the right is a breakout from the original text. BEFORE The author wanted Case Studies pages throughout the book to show examples of work in progress. AFTER Clear labelling, playful headline treatments, and colorful sidebar boxes energized the case study pages. BEFORE Student Gallery spreads ended each chapter with an essay by workshop participants and a showcase of their projects. AFTER Larger photos, text breakouts and visual elements were added to give each student the spotlight they deserved.